An orphan raised at a martial arts dojo in his home country of China, Cancer was bullied by the other pupils, but was determined to become as strong as he could in order to put the dojo on the map. Unfortunately, that's when the Destrons (Decepticons) came along, and Cancer saw joining them as an opportunity to achieve this goal. Alas, Cancer got a little lost in the opportunities he was offered to run wild and be the "tough guy" for the first time, and with the husband-and-wife team of Giga and Mega leading the villains, he has found a sense of family in the Decepticons that he had never enjoyed before. But Cancer doesn't really want to hurt anyone, and the evil of the Destrons is steadily growing less and less palatable for this troubled youth. As a Destron Headmaster Junior warrior, Cancer is bonded to a Transtector from the planet Master, which takes the form of a bipedal crab monster. 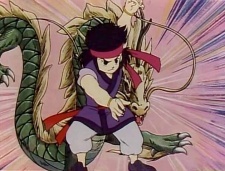 He is heir to the powerful martial arts technique known as Chōryūken ("Super Dragon Fist", which involves… kicking the opponent), a skill that greatly impresses his doting surrogate mother, Mega. He considers his fellow Headmaster Juniors Wilder and Bullhorn genuine friends, and is partnered up with the diminutive Browning, who calls him "boss" and follows his every command.